Despite Chilean food being the culinary equivalent of a wet weekend in Weston Super Mare, thankfully, its wines more than surpassed our expectations. Of the few bottles we’d splashed out on before arriving in Santiago, none had cost more than £2.50 (US$4), and they’d all tasted infinitely nicer than the dust-covered bottles of generic Chilean vino sold by our local corner shop back home. 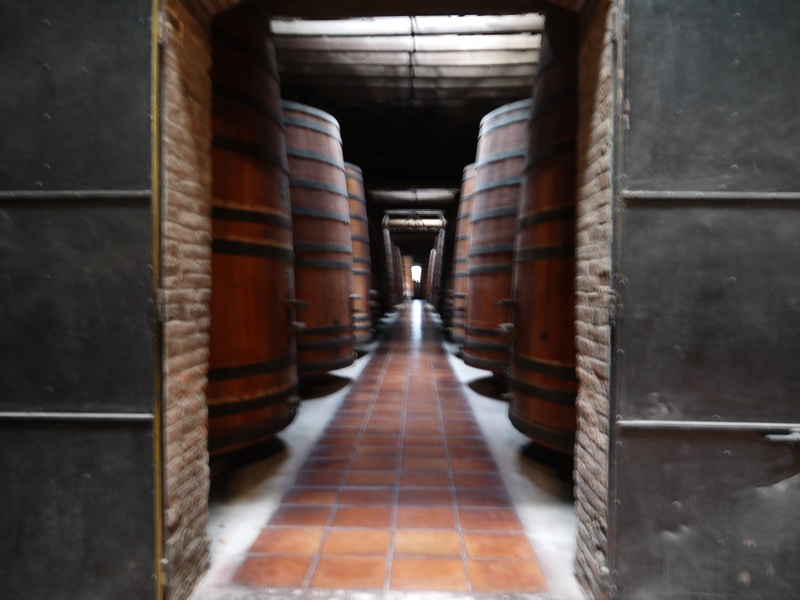 We’d heard lots of good things about wine tours in the Valle del Maipo, one of Chile’s main wine producing regions, so we were looking forward to checking one out on our arrival in Santiago. Despite being one of the most expensive countries in South America, Chile’s wine tours are actually affordable: you get a decent amount of plonk for your pesos, and, you don’t have to have your own car to visit lots of vineyards because if you’re in Santiago: you can just jump on the Metro. The hardest thing to do is deciding which vineyard/s you want to visit. 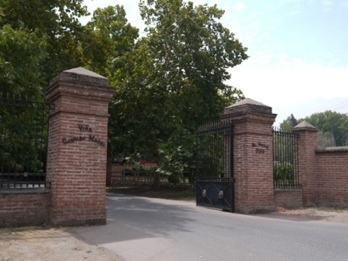 After a bit of online research, we chose Cousiño Macul, Chile’s oldest family-owned winery, which had good reviews, and was just 40 minutes on the underground from our hotel. We booked ourselves on the premium tour, which promised five samples of wine plus a cheeseboard. We duly arrived at the high-walled vineyard at the allotted hour of 11am, to be greeted by blank faces. Our booking had been lost and they weren’t expecting us, but did we want to take the standard tour, in Spanish, that was leaving now? Just as we were about to be typically British and accept their offer, one of the guys behind the desk took pity on us and called a colleague to arrange a tour, in English, just for the two of us. We couldn’t believe our luck! Our man with the vin, Alvaro, a knowledgeable Sommelier who had worked as a tour guide at Cousiño Macul for six months, was extremely keen to answer all our questions in perfect English whilst quizzing us on our trip, as he showed us round the family’s grounds and explained the history of the company. Unfortunately, the tour itself was low on production detail as most of the family’s wine is made in a new state-of-the-art facility outside the city. The only wine they still produce on site is their ‘icon’ (premium) brand, Lota, which retails for around $60 a bottle. We’d just about had our fill of hearing about the family heritage and looking at old corking devices when Alvaro led us to one of the old cellars for our first tasting. He handed us each a glass of rosé and we both looked at him curiously. Despite quite enjoying a chilled pink wine on a hot afternoon, it wasn’t quite what I was expecting on a fancy wine tour. However, this was not just any old pink wine, it was called Gris, and taste-wise it was pretty impressive – with bags of summer fruit but far less saccharine than many rosés – and definitely something I would seek out back home. So far, so delicious.. The rest of our tasting took part in the main building, in a specially appointed room, lined with bookshelves containing important-looking viticultural tomes. In front of us was a huge oak table on which selection of five bottles of wine, plus the promised plate each of meats, cheeses, dried fruits and nuts, had been placed. First up was the Chardonnay, a wine which we normally steer well clear of. This version was pretty drinkable though. As Alvaro explained, only 20% of it was oaked, meaning it didn’t have the creamy, buttery taste the stuff stocked in your local supermarket does. The second white was a really interesting blend of Chardonnay (80%), Reisling (15%) and Voignier (5%) called Finis Terrae (‘The End of the Earth’, Latin lovers), a pale coloured wine with a slight plasticky (in a good way) aroma. It could have gone down nicely with a oven-baked camembert. We generally take the easy option when choosing a white wine and go for a Sauvignon Blanc or Pinot Grigio, but after trying a blend we agreed we’ll definitely branch out a bit more in the future. Next our guide took us through the big hitting reds, the wines that Chile is famous for. In front of us were a Camenere, a Merlot, a Cabernet Sauvignon and another blend under the Finis Terrae moniker. All of these were exceptionally good wines. The Carmenere, a grape that was originally thought to be extinct but then found growing in Chile, was violet coloured and slightly herby. The Merlot, Dean Smalley’s favourite grape, but one which Jovian maintains has the depth and subtlety of a Miley Cyrus concert, was surprisingly complex. Our favourites however were definitely the Cabernet Sauvignon and the Finis Terrae. The Cab Sav was fruity, jammy with an aroma of caramel. It made our mouths water for a juicy steak then and there. The Finis, a blend of Cabernet Sauvignon (72%), Merlot (20%) and Syrah (8%) was strong on tannins with a smoky, leathery taste: perfect for a lazy afternoon in front of a roaring fire at the Country Club. After we’d worked our way through the reds, Alvaro disappeared outside and returned with yet another bottle of wine. He explained that he wanted us to have a complimentary taste of their late harvest Reisling Viogner: a desert wine that was subtlely sweet, with more than a hint of peaches and cream, it provided the perfect finish to an impressive tasting. If we’d had more time in Santiago we’d definitely have treated ourselves to bottle but as we had a bus to Valparaiso the next morning, we stumbled, contented back into the daylight, looked up at the incredible views of the Andes looming behind us, and began the long dusty walk back to the Metro station. Thanks for the wine reviews! I’ll have to cross my fingers and see if I can ever find any of these wines state side.